Smart Industries: Cranes, Photo Booths, Self-Merchandisers, Redemption Games, and more! Make sure to check out our Video Center for all the latest videos, including videos at IAAPA 2018 from industry guru Frank Seninsky and the popular Crane Couple from YouTube! Everything you love about Ticket Time plus exciting new features! Unique spinning bowl scans ticket rolls quickly, puts the values on a player's card and dumps the rolls back into the game with the Auto ReLoad system. No more manual re-loading ticket rolls! Color changing LEDs light up the bowl and frame (red, green, blue) Optional Programmable LED grid on the bowl/stand can display different messages! Optional video monitor adds to the excitement with animated screens and sound effects! Capsules HouseTM: Stop the arrow on a target to win! Capsules dispense to the player and the system refills the empty target automatically! Mega TicketsTM: Similar to Capsules HouseTM but for tickets! Stop the arrow on a target to win! 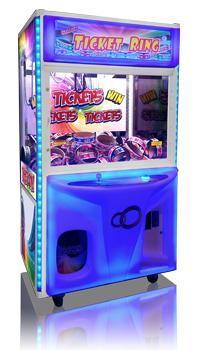 Ticket balls dispense to player and the system refills the empty target automatically! The best looking candy crane ® just keeps getting better. 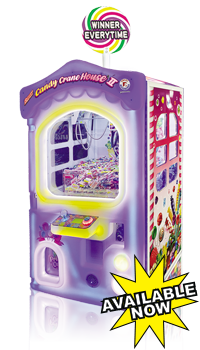 Candy Crane House II ® features a wider cabinet and 3D front door. The first candy crane ® ever with full front illumination! Perfect as a "winner every time" crane. Fits through standard doorways with roof attached, and fits under standard 8’ ceilings with lollipop topper added. Mega PrizeTM: Great Hold & Release timing game! Try to line the scissors up to cut the string. If you release the button at the right time, you'll release the biggest prizes ever from an auto merchandiser! Prize WorldTM: Get the right ticket and the prize doors open automatically! Smart's unique Ticket Crane system has been featured in a recent article. See the whole story from rfidjournal.com. Smart's Ticket TimeTM and Giant Taj Mahal ® cranes have been incredibly popular and profitable for operators so far, but there is a new addition which everyone should be excited about - the Ticket RingTM 45" crane. Players attempt to win ticket rings in various values. The rings can be redeemed at the redemption counter where tickets or swipe cards are used. In swipe card locations the attendent will credit the players card with the value of tickets won. In all locations the rings are then recycled back into the game. Also, Smart Ticket Cranes have been featured in a recent cover story by RePlay Magazine. See the whole story from Replaymag.com. Smart's Ticket Time® cranes have been incredibly popular and profitable so far, but there is a new addition which operators should be excited about - the Ticket-SmartsTM system. 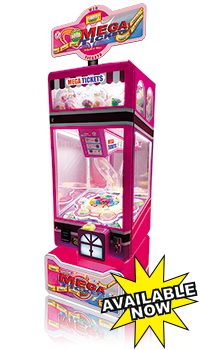 With the new swipe card / RFID system, the Ticket Time® crane will read the ticket bundles the player wins but not dispense them, which has been a challenge ticket cranes have had until now. Instead, the ticket values are recorded automatically on the player’s card. Basketball legend Kareem Abdul-Jabbar went head-to-head with Jimmy Fallon on the Tonight Show, using two Shoot To WinTM Basketball games linked together. We are pleased to announce a new version of our very popular Candy Crane House ®, now with the "Gear Factory". Large 3D gears move on the inside back wall as kids play the game, attracting new players! We had a great time at IAAPA this year. We introduced some new games and brought along some previous favorites. The new Ticket Time crane was introduced, which we are very excited about as it shows great real-world earning potential in several locations already. Please take a moment to watch our video if you weren't able to meet us in person at the IAAPA convention. Smart Industries is excited to bring back the Prize Time® line of cranes, but with an exciting new twist! Add illuminated brilliance to your location with the new Prize Time Deluxe®. This great new crane features fully lit front panels with colors cast by LEDs. Choose the colors that best fit your location and add elegance and attraction to your crane. Players will be drawn to these colorful new units which is sure to be reflected in the cashbox. Prize Time Deluxe® is available in a variety of colors. Make your color selection and order yours today. Smart Industries is pleased to present Ultima AssaulterTM and Boxer BabyTM, two new and very different punching bag games! The Ultima AssaulterTM is the hot new punching bag game with the great look customers will be drawn to. Players are challenged by different characters on the screen. As they punch the bag, the different characters will respond depending on the strength of the punch. The game also features tournament play where a number buy in to compete in the same game. The interactive graphics feature is the first of its kind on a punching bag and creates an exciting element for players. Boxer BabyTM is HOT. This fabulous new punching bag game features exotic images that are exposed when the bag is hit. The harder you hit, the more you see. The game features 3 options for play - Male, Female, and Magic show. 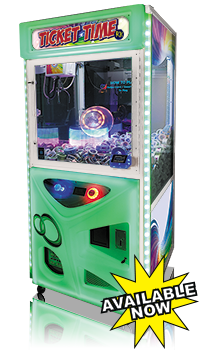 The games exciting game play, all-metal construction, first of its kind video feature, and Exclusive 1 Year Limited Warranty make this machine a winner. Smart Industries is pleased to debut our first ever game that combines both redemption & self merchandising in one package. This delightful unit features the exciting play of a hammer game as well as options for ticket redemption and/or a merchandise vendor. The game has 4 different configuration options. Ticket only, Prizes Only, Tickets & Prizes, and Entertainment Only. After coin-up, the player selects the prize they want to win, prize 1,2,3, or 4 using the select button on the front of the game. The game will then generate the score necessary to win a prize for that game on the lower right display. If a player reaches the necessary score at the end of the game, the prize will dispense automatically. 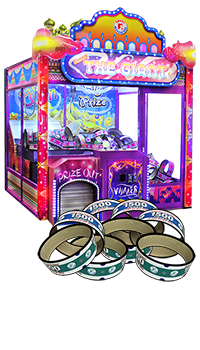 If a Ticket Dispenser feature is used and a player does not reach the score necessary to win a prize, the game will dispense the number of tickets to the player based on the score. See more photos and get all the specs on the Fright NightTM product page. Smart Industries is pleased to present a new 2 hoop basketball game featuring for the first time ever, the "Basket Defender". Shoot to Win Arena® not only lets the players play each other, but at the same time the players compete against the machine. As the players shoot the basketball, the game defenders' moving hands move up and down to block the shots. Arena simulates realistic challenges seen on the real court. This exciting new addition to the Smart Shoot to Win® lineup creates challenges, excitement and fun not seen before. Get to the Arena, and get into the game! The game will be making its debut at IAAPA, booth #1718. See more photos and get all the specs on the Shoot to Win Arena® product page. Happy Dance presents both the interactive and video elements of exciting redemption games. Players slide Happy (The Penguin) down the track and he slides on the ice. The video incorporates the game sensors and illustrates him as he reaches different scoring levels. The game creates exciting entertainment as Happy tries his best with his friends cheering him along. See more photos and get all the specs on the Happy DanceTM product page. Galaxy GarrisonTM is a great new whacker redemption game where players use a tapper to bop the aliens before they can get away. This is a great new game with an updated twist. The game has a small footprint of 27"W x 21"D x 38"H. Not only does it include a great graphics package, it includes a playfield with uniquely lighted spaceships (not seen on similar games) where the aliens can escape. The combination of the audio, lights and gameplay make this a very nice addition to the Smart line-up. See more photos and get all the specs on the Galaxy GarrisonTM product page. This is the ultimate photo booth! This booth has all the great features and options available on the Sit-Down Hollywood Photo Booth, but in a more compact footprint. Customers can take a 1, 2, or 4 pose photo, a photo with background, or an outrageous character photo. Photos are printed onto 4"x6" glossy photo quality paper for an exquisite image every time. Everything you want from a Smart photo booth is wrapped up in a sharp-looking, durable metal cabinet. Decals are easy to change depending on your location or for use in photo booth rentals. Also available with the option to record up to 30 seconds of video and to email your photos or video messages. See more photos and get all the specs on the Upright Photo Booth product page. Ahoy, Maytees! Happy Sailor is a great new redemption game where players attempt to fill a glass by moving it back and forth to different faucets. With 3 stages of play, the player can win tickets and redeem them for prizes. If a player can get past the first two stages, the player enters the bonus round to win 0 to 999 tickets. Watch the video, see more photos, and get all the specs on the Happy SailorTM product page. Is a Candy Crane ® too small or a 45" crane too big? Try the "Hot DiamondTM". These cranes offer all the great features of other Smart Cranes in a compact 28" width. Perfect for plush, jewelry, or high-value products like MP4 players. This new printer (pronounced "hy-tee") is able to print high quality 4"x6" glossy color photos for only 20 cents per print (suggested retail price)! The new printer's larger size makes it the highest volume 4x6 printer in the industry, with a capacity of 1000 prints per paper roll. Photo booths are all about ROI, and a booth which can produce prints at 20 cents will deliver almost twice the profit as other systems where media is 39 cents or higher. Find out how to upgrade your printer today! Of course, Smart's Hollywood Photo Booth always provides several printing options including Backgrounds, Outrageous Characters (put your face in an image), and the classic 1/2/4 poses. The booth also features the Event Rental Mode which lets you customize the photo print artwork for special events. Also new in the Event Rental Mode is the ability to print full color or grayscale strip photos! These photo booths are shipping now, so contact Jim Dupree at 800-553-2442 today. Hot Tickets is the new ticket redemption game where players can win up to 995 tickets! Players try to drop a mechanically operated plunger through any of 10 different holes to win corresponding ticket values. This great new game features the Smart 7th Generation operating system which is renowned for its dependability and reliability. We are so confident in this system, it carries a 3 year limited warranty. Click Here to watch videos or contact your Smart Industries Distributor today for more info! Hole-N-WinTM is an exciting new self-merchandiser created to generate high profits. This game features prizes hanging from a free release mechanism. Players try to drop a mechanically operated plunger through 4 different holes to win corresponding prizes. This great new game features the Smart 7th Generation operating system which is renowned for its dependability and reliability. We are so confident in this system, it carries a 3 year limited warranty. Click Here to watch videos or contact your Smart Industries Distributor today for more info! Smart Industries presents a new Multi-Player program for the very popular Shoot To Win BasketballTM Game. The new Multi-Player program allows up to four players to compete on a single game. It also encourages multiple plays for each game, therefore increasing your revenues. For example, a player can insert $1 to play a single-player game. Inserting $2 before playing will trigger a 2-player game where each player gets one round of play to compete against each other (and the winner gets all the tickets!). This can continue for 3 or 4 player games as well. Contact your Smart Industries Distributor to upgrade to this new program today! THE WORLD'S LARGEST TICKET CRANE! NEW DESIGN! Updated graphics, top marquee, lighting, corners, console, and prize box! Now we've got another option for those who say "bigger is better" and have more space to take advantage of that. Giant size means giant toys and giant profits! Standing 8 feet high, 8 feet wide, and 9 feet deep, this is a very impressive crane! Comes with great decals, adjustable claw strength, and the ability to vend 25" to 45" merchandise. With prizes like that, this crane will definitely draw a crowd. This design has options for vending plush or giant ticket rolls (with the optional ticket pusher). Smart Industries is a leading provider of coin operated amusement machinery. We have been supplying operators with quality equipment since 1985. Smart Industries provides everything from Crane games to Redemption games and Vending units. With a wide variety of quality machines, the Smart name has become a well-respected name amongst operators. We carry the belief of quality and service with every machine we sell. This is why we pride ourselves on our Exclusive 1-Year Limited Warranty on a number of our components for our products and our exceptional technical support in case you run into problems or just have questions. Join us at IAAPA FEC Summit 2019! If you own or operate a family entertainment center (FEC), this is your event! Join us for three days of learning and fun in Austin, TX, US on Jan. 27-29. Solve challenges, build a valuable network, and discuss strategies that will help FECs increase profits. Smart Industries is proud to sponsor this event. Register today at www.IAAPA.org/FECSummit. Our tech support team has over 33 years of experience with Smart Industries' Products, and they are available from 8am-4pm Monday through Friday, always toll-free at 800-553-2442. However, we also have answers to many common questions available online now on our Tech Support Page. Browse by product name to see if we've already posted the info you need, or check it out to see if there are any new tips and tricks!